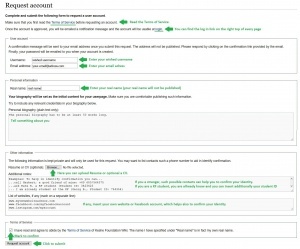 The first thing you need to do in order to be able to edit on the Wiki is requesting a user account. For requesting a user account click on the right top of the page on "Request Account" (Picture Step 1). Read, complete and submit the following form to request a user account. (Picture Step 2). After you have submitted the form, you will be emailed a notification message. Please respond by clicking on the confirmation link provided by the email. (Picture Step 3) Once the account is approved, you will be emailed a notification message and your account will be usable at login (Picture Step 4) For logging in enter your username and password. Especially if you work longer on the Wiki, mark "Keep me logged in" to avoid possible errors during the process. 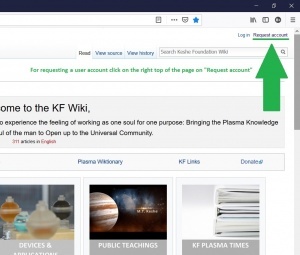 Step 1: For requesting a user account click on the right top of the page on "Request Account"
Step 2: Read, complete and submit the following form to request a user account. Step 3: After you have submitted the form, you will be emailed a notification message. Please respond by clicking on the confirmation link provided by the email. Step 5: For logging in enter your username and password. Especially if you work longer on the Wiki, mark "Keep me logged in" to avoid possible errors during the process. For logging in click on the right top of the page on "Log in". Enter your username and password. It is recommended to click on "Keep me logged in" to prevent possible errors through editing and the saving of it.